A daily itinerary template is made for everyone whether it will be used for personal or professional work. The template is common to be utilize by the students and employees engaged in any aspect of business industry. This is like a planner in which the details are listed for you to remember the things that must be done for a specific time each day. 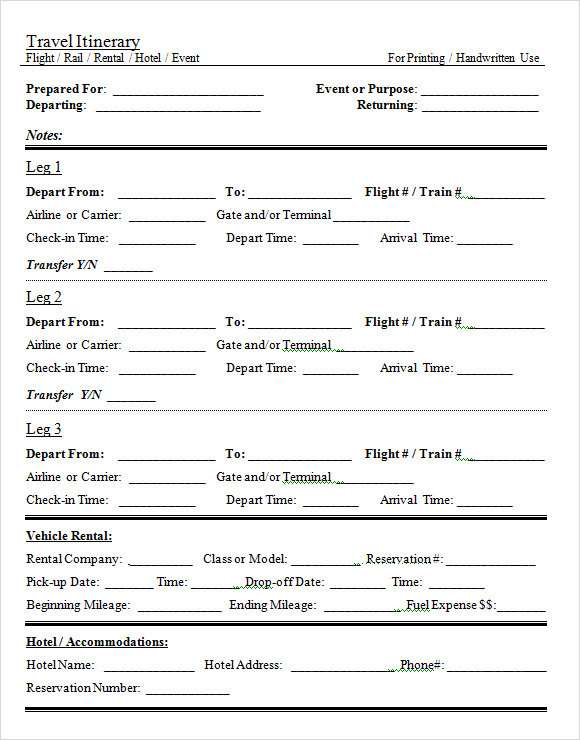 A daily Itinerary Templates is the most effective tool helping the lives of people efficient and easier. With the help of daily itinerary template, people will be given a chance to customize the template according to their needs and choice of layouts and can even create their own. All contents found in the template are editable for it can be open in Microsoft Word. Such template will give everyone a piece of comfort, convenience and cost saving. Having an itinerary for your activities and task daily will help you to save time and effort. 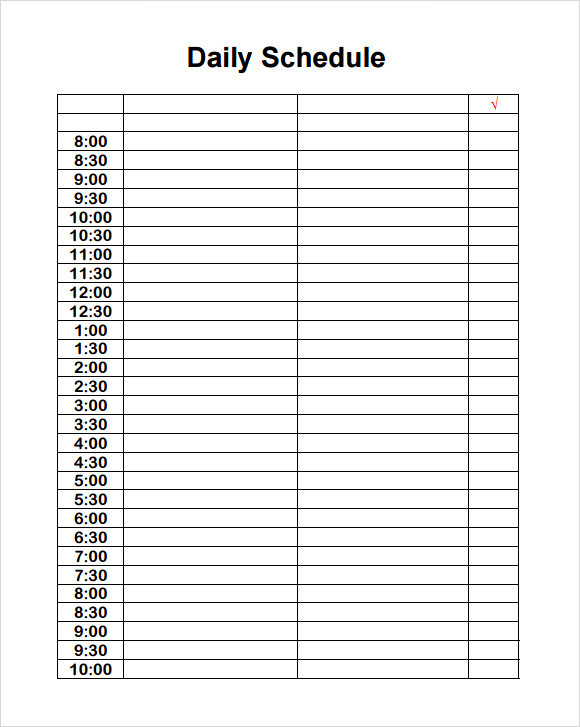 This sample of daily planner template has a very simple design and easy to understand layout. The pattern followed in this sample is on a weekly basis. The top row is dedicated to seven days of the week while the left most columns are dedicated to various time period of the day. The template shows hourly time period. You can increase or decrease the time gap as per your wish. 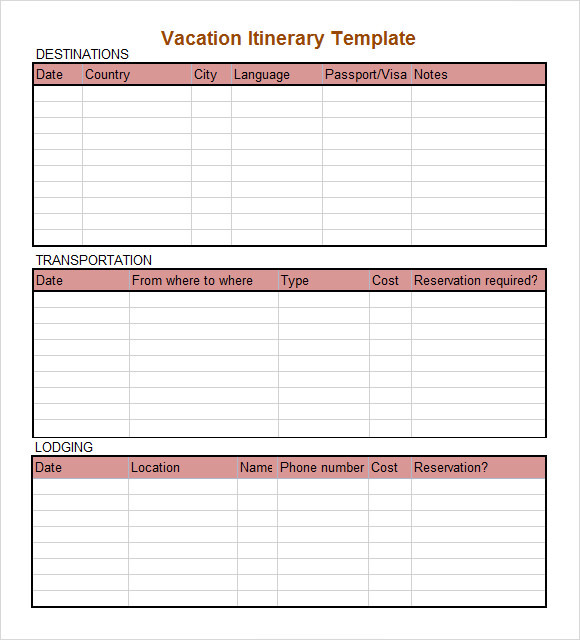 This sample of free itinerary template is designed to plan a trip. The format and layout of the template is simple and has grey and white boxed layout. Six columns are made in the page body for six different items. 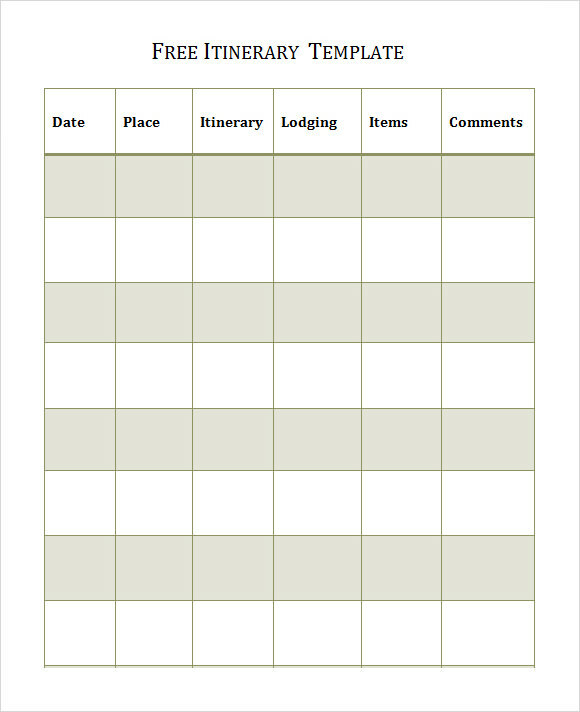 The column in this template is dedicated to date, place, itinerary, lodging, items and comments. You can add or delete the items as per requirement. This sample of weekly itinerary template as the name suggests is meant for someone who wants to make a weekly plan. 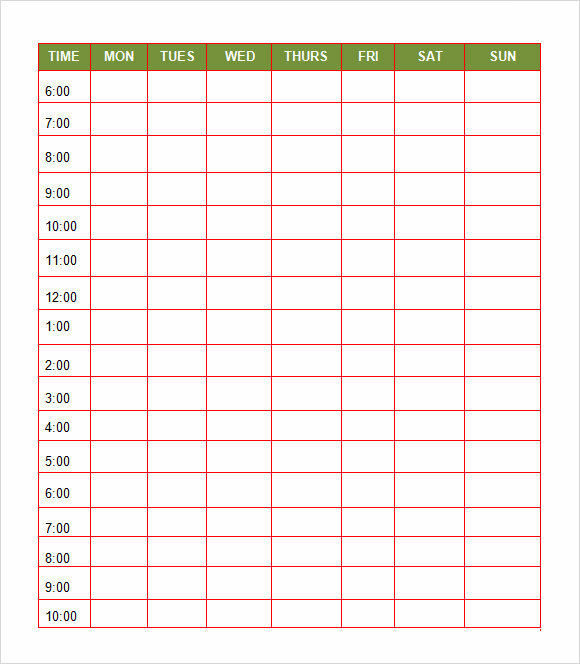 This template is ideally suited for a student who needs to keep a track of their weekly study schedules. 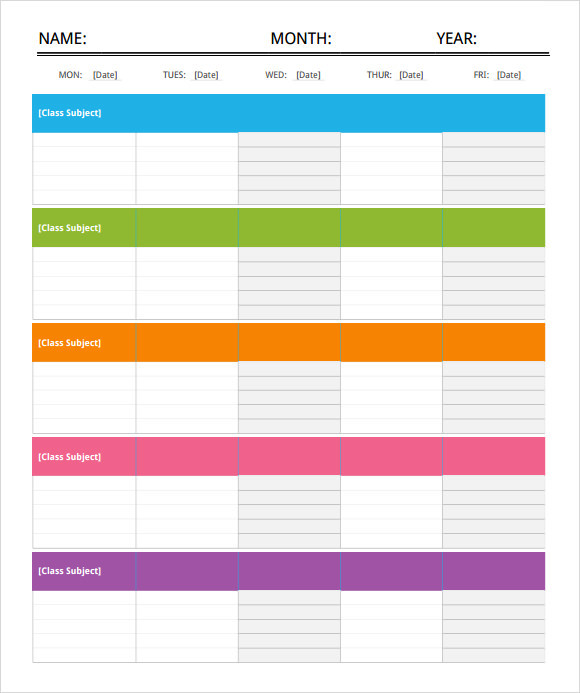 Unlike other templates, this template has a touch of color and each day in of the week is highlighted in a different color. On the header portion, the name, year and month of the student and his class can be written down. 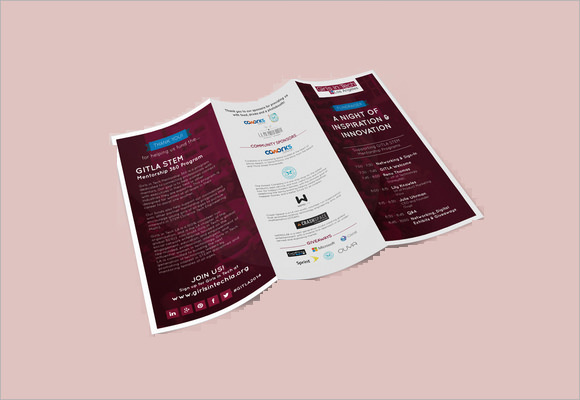 This sample of itinerary template in word format is ideally suited for someone who loves to travel or runs a travelling agency or business. 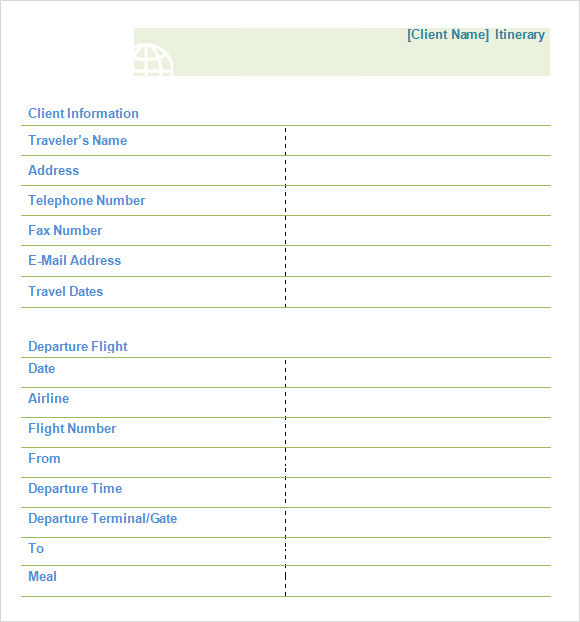 The name of the client is given in the header section which is then followed by the travelers name, contact no and address. The second part is dedicated to list down the details regarding the details of the trip like the flight no, meals, modes of transportation etc. How to create a Daily Itinerary Schedule? Creating a daily itinerary is a simple process that requires very little time. The first step involves getting a pen and paper and then writing down all the tasks that you have at hand. The second step is to write down the list of essential activities like washing sleeping, cleaning etc. the most vital step is to divide your important work according to a schedule which does not clash with any other work. The best way to do this is to divide your day into various time blocks and then allocate each block with a certain activity. Why having a Daily Routine Important? There are many ways of de-cluttering your life. These tips would help you to ensure that you can achieve your aim in a hassle free manner. Keep your work organized. Before going to bed every night, make a list of things that your want to do the next day. The early hours of the day are usually regarded as the productive hours. So schedule some of the biggest activities at that time like hitting the gym or making a presentation While creating a daily schedule, do leave some place for leisure and relaxation. Humans are not like machines and they can seldom work at long stretch. Putting too much pressure on your brains can hamper your well being. Daily itineraries play a big role in helping a person to perform as his optimum capacity. Time management is often regarded as a super power. You can use one of our daily itinerary templates to create your own customized plan which can help you have a better control over your life.